Custom Crystals Jewelry Handmade for Bridesmaid Wedding Evening Party & Brides. 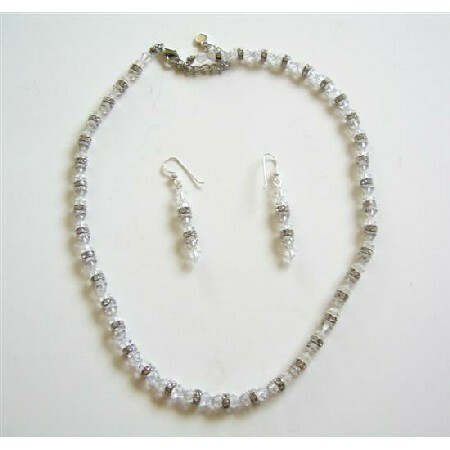 These pretty Swarovski Clear Crystals Necklace & Earrings is made with Swarovski Clear Crystals & Silver Rondells as spacer after each clear Crystals bead which sparkle like real diamond picture might not justify for this confetti & very beautiful sleek & dainty Necklace Set which is the perfect wedding accessory appropriate for brides members of the bridal party & guests. Handmade Exquisite Jewelry All A Grade & Swarovski Clear Crystals Material are used to make this beautiful Necklace Earrings these are Not Glass Beads But 100% with 100% Guarantee Swarovski Clear Crystals.